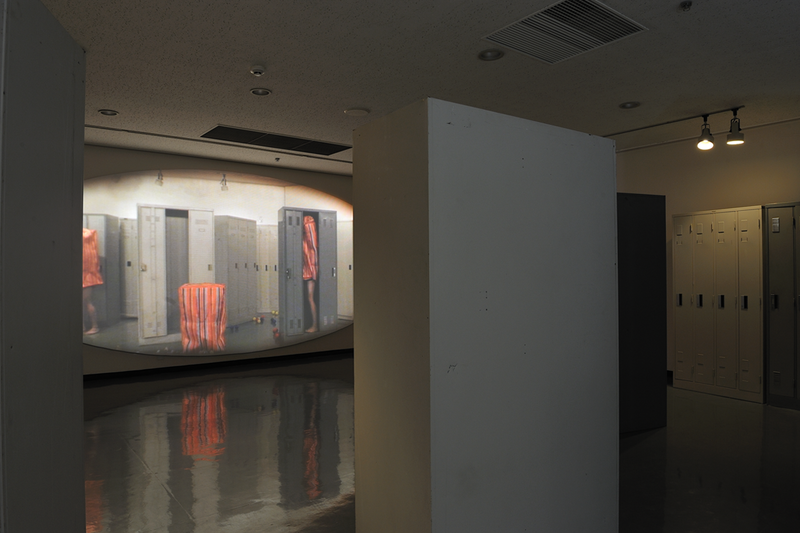 You can enter the room which is a installation piece made by Yosuke Amemiya. The room has over 10 lockers (with many doors). There was a certain time – for a while - where a person can see the oval-shaped screen which is projected as a mirror by a beamer. 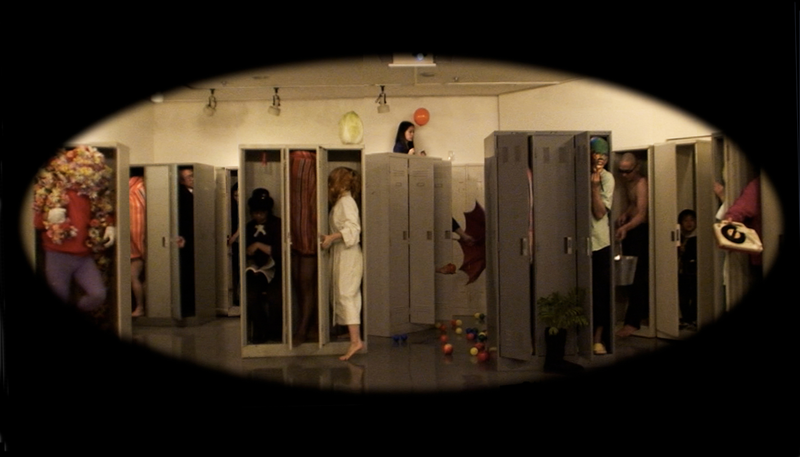 During the mirror-video, an old person came out and walk around from one of the lockers. From another locker, a young woman tried to draw out a steel bench from a door from the locker; there was also a tot running in the space in the video, three bagmen just sitting down in front of their own door. As soon as the woman turned off the switch for the existing light on the screen, it simultaneously turned off the lighting in the physical space. 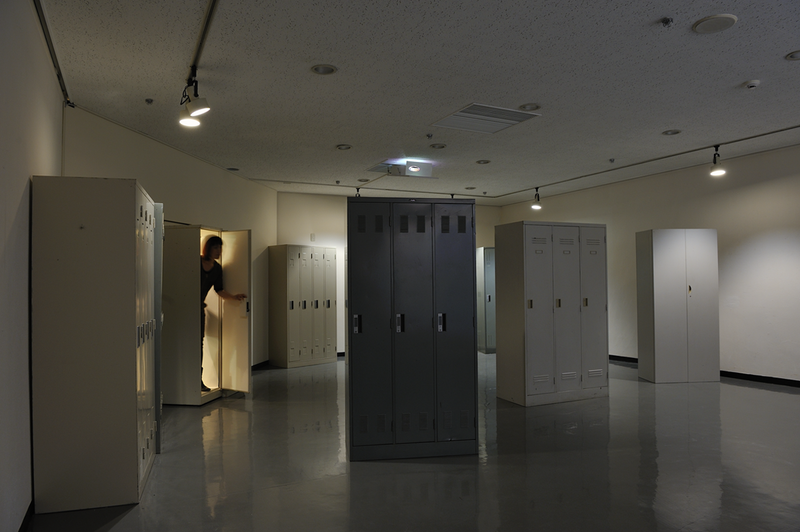 After a man wielded a light with an electric wire, about 20 women went out from the locker room space through the entrance of one of the lockers, showing only their shadow outline. Bright again, the locker people open/close their property, a hand came out with a record player. Then you could listen to the sound of a music "Till We Meet Again". This previous years at Kanagawa Kenmin Hall, we have done the large numbers of exhibiting the young contemporary artists such as " From in silence" of Shiota Chiharu in 2007 and "Between this and that" by Koganezawa Takehito. We are delighted to exhibit 6 artists theme of "Everyday Life Another Space" at our 35th opening anniversary. These writers are highly activated outside the country and it is their first exhibited works in Japan. 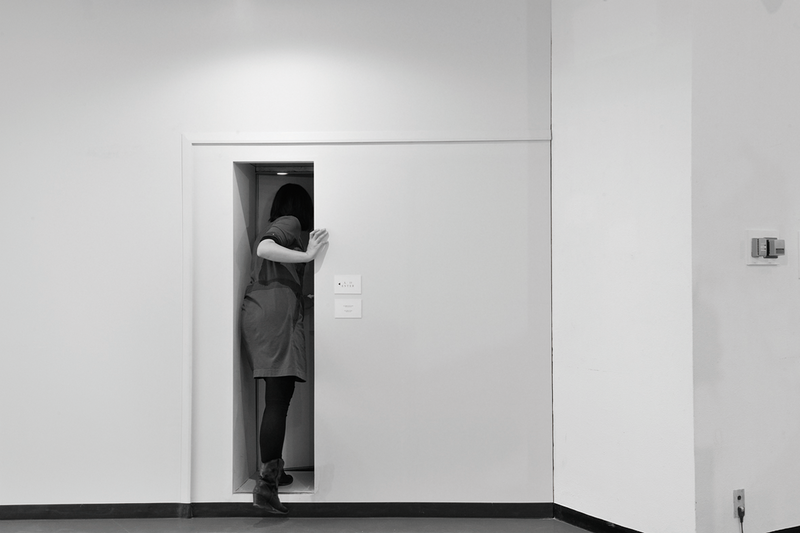 To look for the theme, "Everyday mundane", artists has focused over the subject of "out of place", "strange dimensions" and to feel the "Sense of time" by exhibiting installations. 6 artists will be using Kanagawa Kenmin Hall gallery's individual scale's of 1300㎡ space to meet "Another space". Please meet the exhibition of "Everyday life another space". "We" 2009 Yosuke Amemiya from YosukeAmemiya on Vimeo.